Are you the type of dad that understands and loves sports? 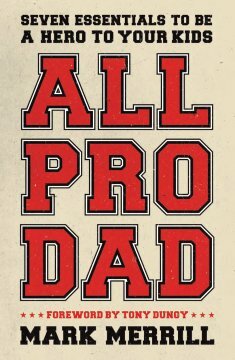 If you are this dad and want a guide to being a good dad, then Mark Merrill’s All Pro Dad is the book for you. Merrill takes concepts of fatherhood and principles of “just being a good dad” that each man with children need to be aware of, and communicates them in a method that reads like a playbook for any professional sports team. All Pro Dad has a huge sports theme and has lots of quotes from “professional” dads like Tony Dungy, Jeb Bush, JB Brown, and Truett Cathy. It is an easy read that takes something very hard and makes it manageable with a few tips and a lot of prayer. Merrill’s foundation is built upon two principles he calls Fatherhood Fundamentals. These are: love and leadership. His thoughts are that men that want to be the best dads that they can be will focus on these two fundamentals. This is done through his list of 7M’s. You’ll have to read the book to learn more about what these are. Here are a few of my favorite quotes from the book. Would I recommend this book? Sure, it’s an easy read that gives great advice. Any dad would benefit from it. This is a book review for BookSneeze.com. I was not paid for this review.